Week 11 was a productive one at the Sustainable Village. Workers continued to install EPS foam (2 layers of 4-inch sheets) in three of the homes with a REMOTE wall system. We also sprayed polyurethane foam around the rim joist to seal it up. Each home has a large, south-facing deck on the second floor. We finished the decks with a spray-applied elastomeric coating, the same stuff used for truck-bed liners, a durable, weather-proof material that is less material-intensive than wood and requires no penetrations in the ceiling. We sprayed foam insulation underneath the deck in the first-floor ceiling to create a warm thermal break. This week we started hanging Sheetrock in the homes where we had already finished plumbing and electric. The interior is starting to look livable! Now it’s time to select 16 lucky students who will make the Village home. If you’re interested, visit http://www.uaf.edu/sustainability/sustainable-village. 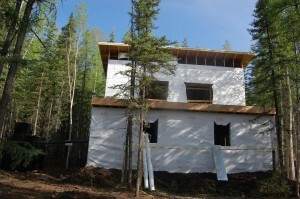 Posted in Sustainable Village and tagged alaska, elastomeric coating, Green Building, spray foam, Sustainability, Sustainable Village, UAF, UAF Sustainable Village, University of Alaska Fairbanks on July 9, 2012 by mrettig. Apply NOW to live in the UAF Sustainable Village! Do you seek a different style of on-campus life? Do you want to know how to grow your own food? Are you excited about monitoring and reducing your energy consumption? Are you aware of your personal carbon footprint? If you answered yes to these questions, consider applying for residency for the 2012-2013 academic year at the UAF Sustainable Village! 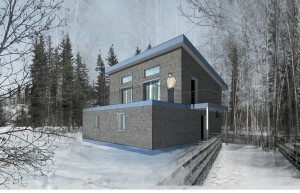 The UAF Office of Sustainability is now accepting student applications for residency for the 2012-2013 academic year at the new UAF Sustainable Village. This opportunity is for students seeking a different style of on-campus life, wanting to know how to grow your own food and monitoring and reducing energy consumption. The UAF Sustainable Village, UAF’s newest student housing, is a student-led and -driven initiative. Students have been integral to all stages of the process: from concept to design to construction. It is a demonstration of environmentally sustainable technologies in a residential setting and will provide hands-on experiential learning opportunities. Students will collect and disseminate information about sustainable building and living best practices, and encourage others to live in a more sustainable way. The Sustainable Village is open to UAF students, sophomores through graduate. Students interested in living in the UAF Sustainable Village for the 2012-13 academic year need to complete this form and attach a signed UAF Sustainable Village Social Contract /Agreement. Selection is based on application and an interview with the Sustainable Village Committee. Students interested in being part of the innovative, nationally recognized Sustainable Village and feel personally committed to sustainability, are encouraged to sign up. For more information visit the Sustainability Village website for more information or contact sustainability director Michele Hebert at mahebert@alaska.edu or 907-388-6085. 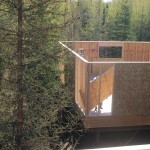 Posted in Sustainable Village, Uncategorized and tagged alaska, fairbanks, Green Building, Sustainability, sustainable design, UAF Sustainable Village, University of Alaska Fairbanks on July 6, 2012 by mrettig. Framing is underway on the 4th and final house. Workers began applying ceiling vapor barriers and Grace rain and ice shields (which act as a drainage plane) to the fully framed homes. Now we’re exploring options for siding and interior finishing, looking at a combination of donated, market-value, and reclaimed materials. 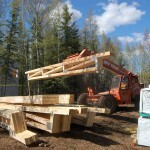 Posted in Sustainable Village, Uncategorized and tagged alaska, CCHRC, cold climate housing research center, fairbanks, Sustainability, Sustainable Village, UAF, UAF Sustainable Village, University of Alaska Fairbanks on June 5, 2012 by mrettig. 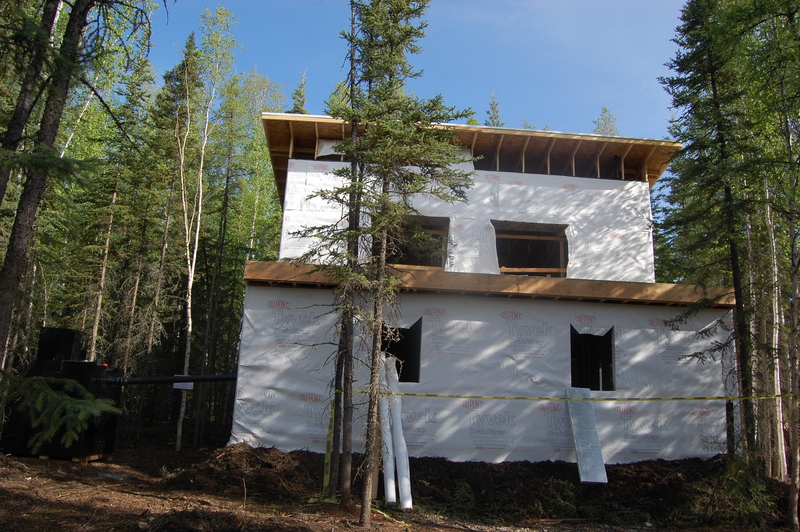 House wraps, such as Tyvek, are permeable enough to allow water vapor through but will stop bulk water like rain. Vapor barriers and house wraps are a critical part of controlling moisture and air flow in and around your home. Working in conjunction with your walls, floor, and roof, the right type and application of these products will help you to conserve energy, prevent mold growth, and maintain the structural integrity of your home. Not using these products or using one incorrectly can wreak havoc. A vapor barrier, also known as a vapor diffusion retarder, is a layer of material designed to slow or nearly block the movement of water vapor. How much a vapor barrier impedes the movement of water is referred to as its permeability rating or, for short, “perm” rating. So it’s a bit misleading to use the term vapor barrier because many materials in this category do allow some moisture through. 6 mil thick plastic sheeting is a typical vapor barrier material prescribed by codes in extreme cold climates, as it’s perm rating is extremely low. All homes generate moisture indoors. Cooking, bathing, breathing – all these activities create water vapor. Ventilation, which is essential to exchange moisture-laden air with clean dry air, helps to reduce the quantity of moisture in your home, but not enough to eliminate the need for a vapor barrier. Without a barrier, moisture can penetrate your walls and roof spaces. Approximately 98 percent of water vapor in a home travels by air, but the remainder moves by diffusion – through solid materials such as the studs in your walls. When these materials become cold in winter, condensation forms and can trigger mold growth and other problems. The extreme air pressure and temperatures differences that occur in Fairbanks in winter exacerbate condensation problems. And, in the case of modern construction, tight building envelopes can serve to concentrate moisture problems in the absence of adequate ventilation. House wraps, on the other hand, are designed to be permeable enough to allow water vapor to pass through them, but will stop bulk water like rain from passing through – sort of like Gortex in clothing. 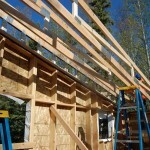 In addition, house wraps can help minimize the movement of air in and out of the exterior walls. Losing air from a house in an uncontrolled manner means that you are losing heat. This loss amounts to extra fuel costs and can become a burden on your budget. To effectively repel water and reduce airflow, house wraps must be detailed correctly and applied using the manufacturer’s recommended methods and adhesives. All those protrusions through your walls such as vents, electrical connections, and architectural features must be carefully accounted for. The right types of house wraps can perform an important job in windy places by stemming significant heat loss. Now comes the tricky part: some house wraps can also serve as vapor barriers and vice versa. Placement and permeability is also a fairly complicated issue. There may be certain cases when house wraps are not necessary, but when used are almost always placed on exterior of a house and over its sheathing. The placement and permeability of vapor barriers and house wraps are addressed by building codes, but vary by region. Vapor barriers are required in Fairbanks. This article only touches on the details required to choose and install vapor barriers and house wraps. You can find resources at the CCHRC and the University of Alaska Fairbanks Cooperative Extension Service to help you make the right decisions. Doing your research up front can save a lot of problems later on. 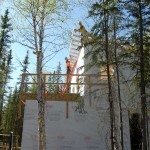 Posted in Ask A Builder and tagged alaska, building, CCHRC, cold climate housing research center, fairbanks, house wrap, Sustainability, vapor barrier on June 1, 2012 by mrettig. 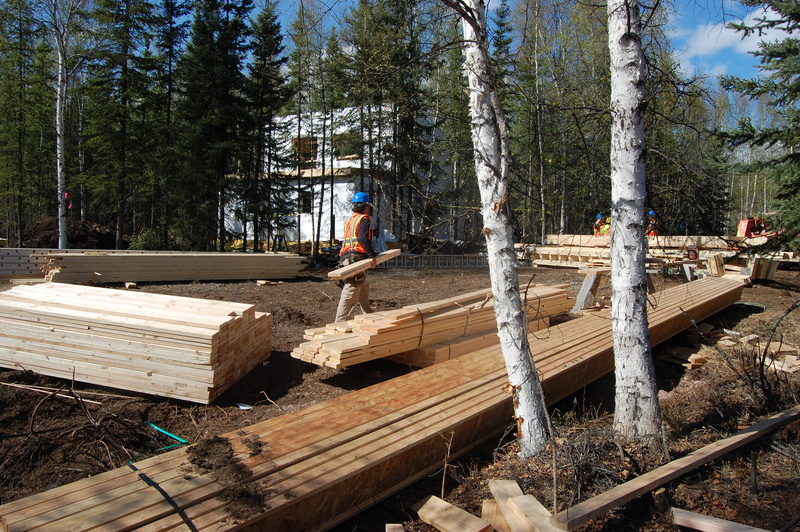 During Week 6, we started framing the third (SE) house and laying out trusses for the two northern homes. 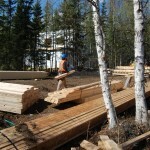 Two more UAF students began working at the site for a total of four. The crew is jelling and construction is on schedule! It warmed up to 65 degrees this week, and the T-shirts and bug dope came out. Next week we are planning to finish roofs on the northern homes and begin plumbing and electrical work. Then we’ll add sheathing and trim. 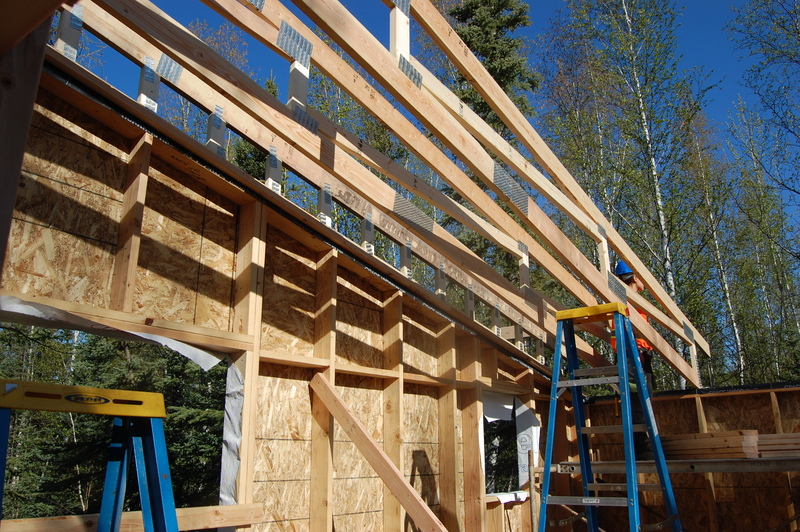 Meanwhile, we’ll begin framing the fourth and final house, which will likely have the Reina Wall–a double wall with thick blown-in cellulose insulation developed by local builder Thorsten Chlupp of Reina, LLC. 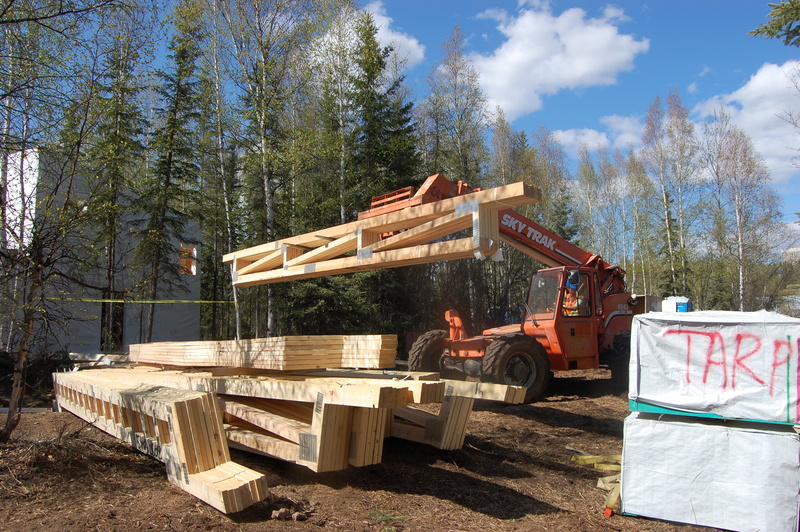 Posted in Sustainable Village, Uncategorized and tagged alaska, CCHRC, cold climate housing research center, fairbanks, Green Building, Sustainability, trusses, UAF, UAF Sustainable Village, University of Alaska Fairbanks on May 18, 2012 by mrettig. How does a rainwater catchment system work and can I install one myself? 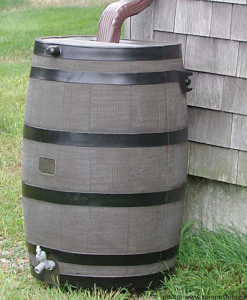 A simple do-it-yourself rainwater catchment system. 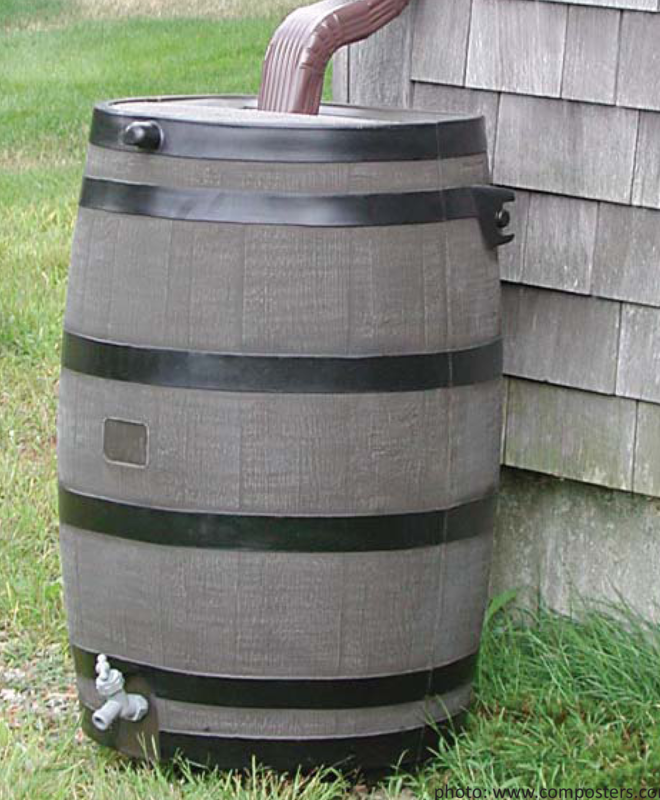 Installing a rain barrel to collect rainwater for non- potable uses is an easy way to help the environment and save money. Water collection systems can be as simple as a rain gutter directed into a barrel or as sophisticated as a buried tank supplied by multiple sources with filtration and pump systems. The easiest way to collect rainwater is to catch it as it drops from your roof and eaves. Of course, this works best if your home has large roofs fitted with gutters, but even a small roof can collect significant amounts of rain. For every square foot of roof, you can collect a little more than a half-gallon of water per inch of rainfall. Fairbanks has an average of 10 inches of rainfall a year (some years much more, others much less). This means a small cabin in Fairbanks with a 1,000-square-foot roof can collect about 5,000 gallons of water per year–more if you collect snowmelt in the spring. One thing you need is a tank. Storage tanks can be fiberglass, wood, steel, concrete, plastic, or another material, though plastic tanks are by far the most prevalent in Alaska. If the system will store water during the cold seasons, then outdoor tanks and lines need to be insulated to protect from freezing. Buried tanks should be at least four feet below-grade and are often protected by a top layer of insulation to prevent freezing. You can often find small above-ground storage vessels at feed stores, or companies that deal in fuel storage, which sell everything from 15 gallon-60 gallon plastic barrels, some with spigots and some without. You may be able to purchase a much larger used tank from local excavation companies (the professionals who install domestic water holding tanks and septic systems) as they replace underground storage systems from time to time. Large new tanks can be found at plumbing stores, excavation companies, or local tank manufacturers. A basic cistern system involves a series of gutters and downspouts that converge at a centralized collection point that in turn leads into the tank. If the tank is above ground, it may be beneficial if it is fitted with a drain valve and an overflow diverter. Provided the tank is elevated above the demand source, you can use a gravity-fed system to move water. If the tank has access from above, you may be able to move water with a submersible pump attached to a hose. The pump will provide more pressure and a consistent flow rate. Over time, the tank will fill with sediment, which will require cleaning periodically. Also, it’s a good idea to empty and clean the tank each year. This will help control algae growth, but also prevent damage due to freezing in winter. Be sure you support the tank adequately – just one gallon of water weighs around 8 pounds. In general, the natural process by which rainwater is formed causes it to run slightly higher in acidity. In addition, the characteristics of your particular rainwater can be affected by sulfur and other pollutants in the air (if present), your roofing material, and any debris that may collect in the catchment system such as leaves, pollen, and bird droppings, for example. Downspouts, gutters, or the tank’s opening can be fitted with screens to keep large debris out of the system. More advanced systems include a trap to minimize unwanted matter from getting into your main tank. A trap is basically a smaller tank containing baffles. Water enters this smaller tank first and filters out sediment and other materials. You may want a system for diverting water from the collection system until a good rain has had chance to wash your roof of heavy pollen or other accumulations. Consider what your roof is made of and ask the manufacturer to make sure your roofing materials are not toxic. It’s possible that old roofs may use asbestos shingles or other toxic materials. If you’re considering a permanent catchment water distribution system, the acidity of the rainwater may need to be adjusted to reduce the long-term corrosive effects of the water on metal plumbing components. If you are looking into building an advanced water catchment system, consider going just a few steps farther. Fitted with additional filters and plumbing, a cistern can provide grey water for indoor use and in some cases, drinking water. Other ways to reduce rainwater and pollutant runoff on our website at http://cchrc.org/green-infrastructure. 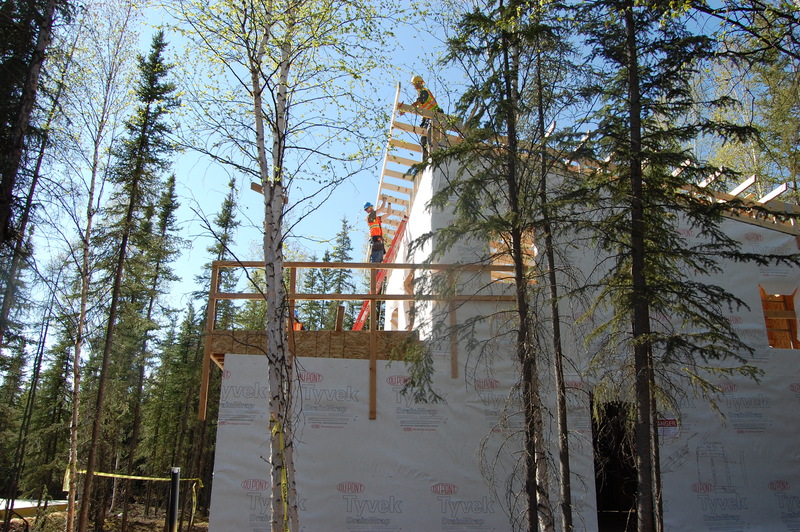 Posted in Ask A Builder and tagged alaska, Ask A Builder, CCHRC, fairbanks, rain barrel, rainwater catchment, Sustainability, water on May 18, 2012 by mrettig. Two of the homes will have insulated raft foundations. This allows the house to rest directly on the ground, keeping the floor warmer than if it were elevated on piles. A thick mat of spray foam is designed to prevent heat loss from affecting the frozen ground, and a cooling system was also installed in the gravel pad to chill the soils if needed. 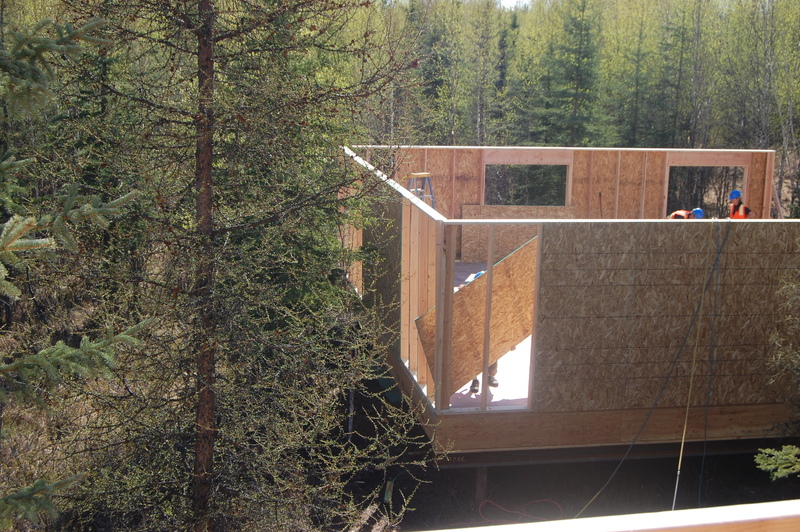 Posted in Sustainable Village and tagged alaska, building, CCHRC, cold climate housing research center, fairbanks, foundation, spray foam, Sustainability, Sustainable Village, UAF, University of Alaska Fairbanks on April 30, 2012 by mrettig. Aaron Cooke, architectural designer at the Cold Climate Housing Research Center, describes the goals of the UAF Sustainable Village and Student Design Competition. Posted in Uncategorized and tagged campus housing, CCHRC, cold climate housing research center, student design competition, Sustainability, UAF, UAF Sustainable Vllage, University of Alaska Fairbanks on August 31, 2011 by mrettig. As the New Year approaches, many will be making resolutions. What of the gardeners? My wish is that each and every one of us will resolve to turn our backs on the use of chemicals. It isn’t very hard to build a case that no gardener should use chemical fertilizers, insecticides and the like. In fact, it isn’t very hard to build the case that no gardener should be ALLOWED to use them. Gardening, after all, is just a hobby. No matter that the poison you spray on your lawn drifts up to 75 miles when there is even just the slightest breeze, impacting the innocent child playing in the yard in the next town or the moose in the forests you may hunt and consume as much as it impacts the dandelion which is its target. Posted in Alaskan Efforts, Sustainable Living and tagged Gardening, Sustainability on January 13, 2011 by mrettig. The New Year’s resolutions you keep are those that become new habits. How do you create new habits? One of the best ways is to break down your larger goals – whether that’s bettering your health, as it so often is after holiday binging, bettering yourself or bettering the world at large – into bite-sized mantras and rules. You’re convinced that a vegetarian diet – or at least a diet with more vegetables than the one you eat today – is healthier for you and the planet, but despite the evidence, you can’t get on board with such a big change in your diet. So just go meatless on Mondays. It’s a growing nationwide trend with its own organization and Website. Eating vegetarian one day a week will give you the space you need to get comfortable with new vegetarian recipes, and before you know it, you’ll be eating more vegetarian meals throughout the week. Posted in Recycling, Sustainable Living and tagged Recycling, Sustainability on January 11, 2011 by mrettig.